Thread identification means learning the thread size and pitch. The thread size is determined by the outside diameter of the male thread, or the inside diameter of the female thread. Pitch refers to the distance from one thread groove to the next (measured from crest to crest). There are two systems for measuring threads – metric and imperial (same as SAE or American). Metric thread is measured in millimeters. For example, M10x1 refers to 10 mm diameter and 1 mm thread pitch (M stands for Metric). 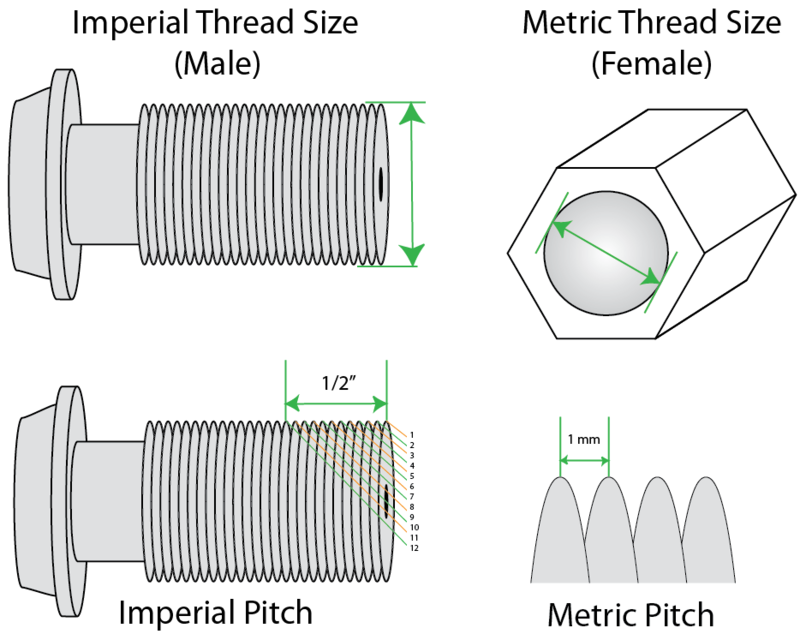 Imperial thread diameter is measured in fractions of an inch and imperial pitch is measured in threads per inch (TPI). For example, 3/8” x 24NF refers to 3/8” diameter and 24 threads per inch pitch (NF stands for National Fine; other options are NS – National Special and BSF – British Standard Fine). The easiest thread identification method is to use a thread ID gauge (such as BrakeQuip Thread ID Kit – Part# BQ2100). Alternatively, you can take an unknown male or female part and try to screw it together with a part you already know the size of – if it fits, you now know the size of both. However, you do not need a thread ID kit or identified nuts and bolts for correct thread identification. You can measure the thread to ID it. First, use calipers to measure the thread diameter. The male threads will be slightly smaller than the nominal size, and the female threads will be slightly larger than their nominal size. Next, measure the pitch. For imperial sizes, count the number of crests within a ½” section and multiply it by two to get TPI. If your thread is long enough, count the number of crests within one inch to get TPI. For metric sizes, just measure the distance between the two crests. The most commonly confused sizes are 3/8” with 10 mm, and 7/16” with 11 mm. The 3/8” x 24NF will screw into M10 x 1 thread but not the other way around, so always try to screw M10 x 1 into 3/8” x 24NF to see if you have a match. If you are deciding between 7/16” and 11mm, the safer bet is to go with 7/16” because 11 mm is extremely rare. It is possible to have a metric thread on one end of a brake line, and an imperial thread on the other end. US after 1980 – could be either, thank you Detroit!